ATLANTA (April 18, 2015) -- Georgia became the latest Southern state to legalize medical marijuana this past Thursday, when Republican Gov. Nathan Deal signed a law allowing use of cannabis oil to treat nine specified conditions. An emotional Deal was joined by medical marijuana patients and their families as he signed the bill in the rotunda of the state capitol. The new law allows cannabis oil with THC content of up to five percent for treatment of seizure disorders, cancer, amyotrophic lateral sclerosis (also known as Lou Gehrig ’s Disease), Multiple Sclerosis, Crohn’s Disease, Parkinson’s Disease, mitochondrial disease and sickle cell anemia. Rep. Allen Peake, the lead sponsor of the law (pictured), is a conservative Republican and former seminarian from Macon, a city that according to local lore has more churches per capita than any other in the South. He became an advocate for medical cannabis after meeting Haleigh Cox, for whom “Haleigh’s Hope Act” was named. “I was committed to doing whatever it took, whatever political capital I needed to spend, whatever political risk it caused me, that I was going to do everything I could to provide access to cannabis oil for families in Georgia,” Peake says. Haleigh, now five, was at the signing ceremony with her family and received the first temporary medical marijuana card during the ceremony. 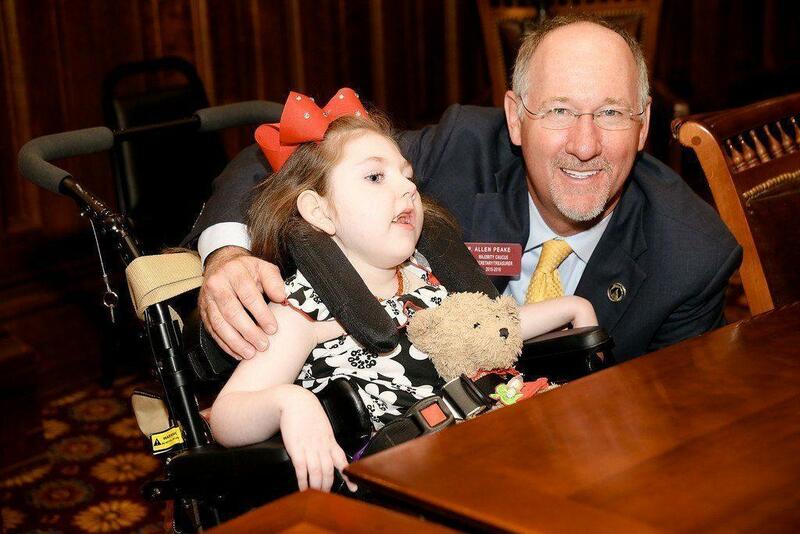 But her family, along with others seeking cannabis treatment in Georgia, still face hurdles. A registry of patients is being set up, but marijuana cultivation is still illegal. The law establishes a commission that will make recommendations on in-state cultivation and processing in next year’s legislative session. In the meantime, Peake cites the “Charlotte’s Web” strain of low-THC, high-CBD marijuana grown in Colorado. Realm of Caring, the organization that distributes Charlotte’s Web, says that its THC content, at less than 0.3 percent, is so low that it is classified as a food product, and Peake says RoC will ship to Georgia. But Peake emphasizes that this is not a first step toward broader legalization.